If you’re a big movie buff like me, you’ve probably seen the 1990 classic, Total Recall. It’s one of the first films to introduce a self-driving car. You may think, “Self-driving cars? Those are just futuristic fantasies.” Not quite, sir or madam. In recent years, self-driving cars have become more realistic due to evolving technology and Google. Yes, that’s right, Google. Not only is the internet giant controlling the web, they are also creating autonomous vehicles. In 2005, Google entered their autonomous car, Stanley (built from a Volkswagen Touareg), into the 2005 DARPA Grand Challenge (a race of robotic vehicles). Not only did the car do well—it won. 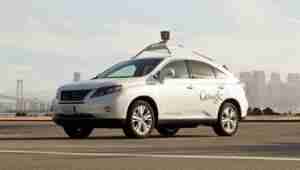 Ever since then, Google has been test-driving autonomous cars in Nevada and near their headquarters in California. Google currently has ten driver-less cars; including an Audi TT, three Lexus RX450h’s, and six Toyota Prius’. These cars have gone 300,000 miles without an accident. I’d say that’s pretty impressive for an autonomous car, even though I find it quite terrifying to allow a robot to drive me around. But then again, 95% of car accidents are due to human error. Now, let’s talk about how these cars work. Autonomous cars are fascinating, whether you like the idea or not. The technology is extremely advanced, using Google’s maps and satellites to record images of the road and their signs. They are also able to see traffic lights before they are even in a human eye’s field of view. That’s impressive. The cars use optical lasers and sensors to process their surroundings, which is actually quicker than the human brain. After the car has driven the same path a few times, it will be able to recognize where pedestrians cross; thus, in a way, communicating with people. Another cool feature of these cars is “platooning,” where multiple autonomous cars drive inches away from each other to act as one unit. This is used to limit one’s time sitting in traffic, since most of us can’t stand it. This may seem dangerous because we humans don’t normally drive that close to each other (well I know I don’t), but with the advanced technology controlling the car, there should be nothing to worry about. No one is sure of the exact date we will be seeing these magnificent cars in the hands of consumers, but we know GM has done its own testing. Hopefully, we will see some autonomous vehicles in showrooms within the decade. As of February 2013, three U.S. states have passed laws permitting driverless cars: Nevada, Florida and California. In California, proposed legislation would require that “the driver would still need to sit behind the wheel in case the robotic functions of the car suddenly fail and a real driver is needed,” thus limiting the benefits that autonomous cars could provide unlicensed drivers. In the 2013-2014 legislative session, Colorado and Michigan have introduced legislation addressing the regulation of automated vehicles. Michigan’s proposed bill is currently in the State Senate Transportation Committee. Colorado’s proposed bill has been rejected in committee.